Stop signs are a hot topic in bicycling circles these days. The Metropolitan Transportation Commission in the Bay Area is considering a measure to allow bicyclists to treat stop signs as yields, similar to the present law in Idaho. And as fuel pump refugees crowd the bike lanes and streets as new bicycle commuters, a few motorists are raising the tiresome "bicyclists at stop signs" complaint. Hey, they gotta gripe at someone, right? And they can't touch the oil companies. The "bicyclists don't stop" canard is among my favorite motorist laments, and I've responded to it before. Stop signs are a recent creation of the automotive age, intended primarily to regulate motorists intent on crashing into each other. The characters in this video don't seem overly concerned with bicyclists. (And note the bike subversively lurking in the background of the creative studio at 3:40.) Bicyclists are simply not a significant public health threat. The rush of new cyclists, created by high gas prices, is driving up demand for bike safety classes. 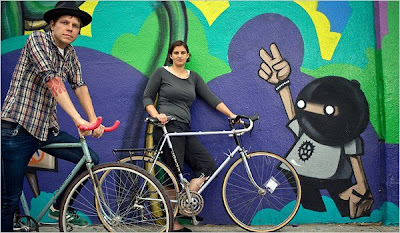 San Francisco - Like many Americans, Tara Collins hadn't bicycled much since middle school. That changed this year when she started paying $50 to fill up her gas tank. Since early July Ms. Collins has been biking to her job in San Francisco. Now she's sitting in Bert Hill's bicycle safety course--along with 31 others--after a close shave with a van. "When that happened I thought, 'Wow, there probably are things I could learn about safety,'" says Ms. Collins. "I haven't been on a bike in years, and even when I did, it wasn't in traffic." The high price of gas is creating a surge in bicycle commuting across the country, not just in West Coast cities but in places like Louisville, Ky., and Charlotte, N.C. The rush of newbies has triggered tensions with drivers unaccustomed to sharing the road, and driven cyclists to seek out traffic training. It will be some time before we have quantitative information on the growth of bicycle commuting. Among the anecdotal evidence for the recent increase in bike commuters is this article on the growing demand for bicycle safety education in many cities. I'm certified by the League of American Bicyclists as a League Cycling Instructor (LCI #1237). I certainly believe in the value of bicyclist education, and encourage new bike commuters to enroll in courses such as the San Francisco Bicycle Coalition's Urban Bike Training and the League's Bike Education programs. However, Bike Ed classes in themselves will never be adequate to transform the U.S. into a North American Denmark. Bicyclists in most communities confront a hostile street environment, produced by traffic engineers who have prioritized car speed over every other consideration for more than 60 years. Bicycling advocacy remains the key. It was the San Francisco Bicycle Coalition's advocacy that won funding from San Francisco's Municipal Transporation Agency for the coalition's Urban Bike Training program. It was advocacy that won closure of a block of Waller Street in Golden Gate Park to create the dedicated bicycle training facility pictured above. I firmly believe Bike Ed should not be offered by volunteer organizations, it should be government funded, supported, and encouraged. Street safety is a public responsibility; the burden shouldn't be shifted to well-intentioned enthusiasts. Bike organizations may contract with public agencies to deliver the training, but shouldn't use their own precious volunteer energies and resources substituting for public agencies. I would urge my friend Robert Raburn of the EBBC to fire back a funding request at the mayors demanding bike safety training. Beyond class or street instruction, I take a broad view of bicycle safety education. Bike lanes are educational, indicating to motorists the legitimacy of bicyclists on the streets. "Sharrows" are educational, showing cyclists the riding position to avoid the door zone and the direction with traffic, while simultaneously informing motorists of the presence of bike riders. 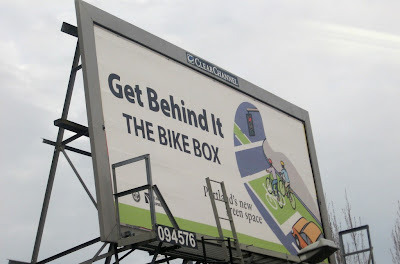 Bike route signs, media outreach campaigns, public service announcements, public art projects, bike racks, bus signs, newsletters, blogs, and websites are all educational, informing both bicyclists and motorists about the rightful place of bicycling in our culture. Education is important, but infrastructure is critical. Advocacy is the key for bicycling friendly infrastructure. San Francisco Ponders: Could Bike Lanes Cause Pollution? New York is wooing cyclists with chartreuse bike lanes. Chicago is spending nearly $1 million for double-decker bicycle parking. San Francisco can't even install new bike racks. Blame Rob Anderson. At a time when most other cities are encouraging biking as green transport, the 65-year-old local gadfly has stymied cycling-support efforts here by arguing that urban bicycle boosting could actually be bad for the environment. That's put the brakes on everything from new bike lanes to bike racks while the city works on an environmental-impact report. Cyclists say the irony is killing them--literally. At least four bikers have died and hundreds more have been injured in San Francisco since mid-2006, when Mr. Anderson helped convince a judge to halt implementation of a massive pro-bike plan. (It's unclear whether the plan's execution could have prevented the accidents.) In the past year, bike advocates have demonstrated outside City Hall, pushed the city to challenge the plan's freeze in court and proposed putting the whole mess to local voters. Nothing worked. "We're the ones keeping emissions from the air!" shouted Leah Shahum, executive director of the 10,000-strong San Francisco Bicycle Coalition, at a July 21 protest. Mr. Anderson disagrees. Cars always will vastly outnumber bikes, he reasons, so allotting more street space to cyclists could cause more traffic jams, more idling and more pollution. Mr. Anderson says the city has been blinded by political correctness. It's an "attempt by the anti-car fanatics to screw up our traffic on behalf of the bicycle fantasy," he wrote in his blog this month. Interesting article in an important national media outlet. As we marketing professionals say, any coverage is good coverage, even if it's not entirely favorable. It's always better to be noticed than ignored. I might have preferred to see more from Leah Shahum--who is intelligent, responsible, and leads a 10,000-member organization--rather than Rob Anderson, who is, as described in the article, a wingnut. But the writer did a good job portraying him as a lonely eccentric, and the article illustrates a real problem of our polity when such iconoclasts can derail sensible public policies. The article and associated video also spends too much time with Critical Mass, which really has little relation with Anderson's lawsuit. An undeniably high-visibility event, Critical Mass as a once-monthly protest/celebration is far less significant in San Francisco politics than the everyday advocacy of the San Francisco Bicycle Coalition, which has been truly effective at gaining significant bicycling enhancements. However, Critical Mass is an attractive subject for biased reporters seeking to malign bicyclists. The traffic impact of Critical Mass is minimal--generally causing only a few minutes delay to any individual motorist--compared to the delays routinely caused by the automotive "Critical Mass" each and every day. Anderson's argument is, of course, ridiculous. Essentially, he's saying that narrow streets cause air pollution from vehicles stuck in traffic idling. Sooo, we should bulldoze some buildings and widen streets, Mr. Anderson? Sorry, been there, done that. And all we got was even more vehicle traffic. This case should have been tossed immediately, if not for the city's inept and sloppy defense of the bicycle plan. The temporary delay has for the moment prevented any on-street improvements in San Francisco. But as Leah Shahum indicated at the Car Free Cities Conference in Portland, important planning and preparation work for bicycle infrastructure has continued at the city's transportation agency, and many projects will be ready for rapid implementation once the stay is lifted. And the SFBC's cultural efforts have continued: Bike to Work Day was a huge success this year, and the coalition's membership continues to surge. 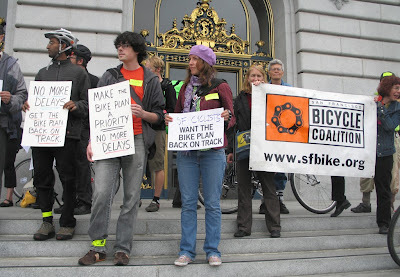 Image: Rhonda Winter/San Francisco Bicycle Coalition. Kai Ryssdal: There's some evidence commuting to work by bicycle is on the rise. A survey out from the advocacy group Bikes Belong says sales of what're called commuter bikes, those are bikes designed for short city trips, [is up]. There's some good reasons. Maybe it's a desire to cut down on greenhouse gas emissions. Or maybe it's gas still at $3.75 a gallon, although you can drop a pretty penny on consumer bikes if you want to. Marketplace's Sean Cole got to ride one for nuthin'. Sean Cole: Wow, I am once again in the saddle. I hadn't ridden in years. But I had to try one of Mike Flanigan's bikes. Mike runs a one-man factory in Holliston, Mass., called Alternative Needs Transport, or ANT. Each bike takes him maybe a week to build. His waiting list is a year long. I'd actually never heard of a commuter bike. It just means a bike with fenders and a chain guard, upright handle bars, maybe a basket, definitely lights and a bell. [bell rings] In this case a special bell from Japan. You have to be up close to see how well made Mike's bikes are, and you might never guess the price. His base model runs $2900. Flanigan: And actually mine is on the low end of the high end market. Flanigan: Oh yeah. People can spend upwards of $10,000 dollars for a bike. Flanigan: Like Specialized tried that in the early '90s...They had a bike called the Globe. Very nice bike. Reasonable priced. Completely failed in the market. Gas was still cheap. Bicycles were still toys. It just, the market wasn't ready for it. Sigh. Envy those bicycle commuters who can treat themselves to one of Mike Flanigan's bicycles ("not sport...transport"). A custom commuting bike is really only suited for those fortunate bicycle commuters who have secure indoor bike parking at work. For us less fortunate bike commuters--who need to leave our rides locked outside vulnerable to theft and the elements--a less costly bicycle is probably best. 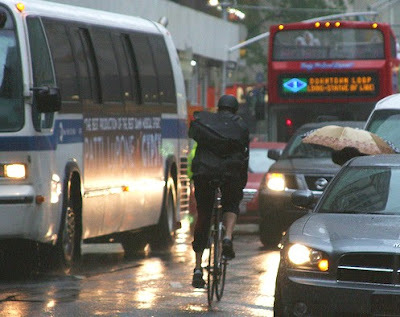 As I've said on this blog before, American employers should really do more to encourage bicycle commuting (showers, lockers, secure parking, etc.) Providing vehicle parking is costly: land, construction, lighting, security, insurance, etc. Yet employers routinely provide car parking for staff, while neglecting the needs of bicycle commuting employees. Many of us might enjoy our commutes more if we used our best quality bicycle, feeling secure about where we kept it during work. This radio report contrasts with an interesting story from Washington DC, where Union Station employees confiscated a woman's bicycle for being "too ugly." Needless harassment of bicycle commuters, I'd say. If Union Station were really concerned about aesthetics, they could provide secure bicycle lockers or, better, a Bikestation-type staffed facility. Then maybe more local bike commuters would feel comfortable leaving their beauty bikes at the train station. Had he been traveling in the correct direction along St. Claude Avenue, I might have been moved by his argument. But he was traveling in the wrong direction, against traffic. My impression is that today's motorists, myself included, are not sufficiently aware of the presence of bicycles or the rights of bicyclists. Ours has become such a car-driven society that it seems as if the average teenager either owns or has access to a car. It's possible that even the youngest drivers on the road haven't been on a bicycle in years. These impressions are on a collision course with the fact that more people are turning to bicycling as the price of gasoline keeps increasing, along with the value we place on maintaining physical fitness. Readers of this blog know I'm generally not effusive in sympathy for the plight of motorists. I can justify much bicyclist behavior that some motorists find objectionable, such as treating stop signs as yield signs (not entirely legal) and taking the traffic lane (entirely legal.) However, wrong way bicycling is just plain evil. Bicycling against traffic is extremely dangerous to the miscreant rider, as motorists don't expect bicyclists coming the wrong way and make turns into the bike rider's path. But wrong way riding is also hazardous to other bicyclists. I work at the most cycling intensive university campus in the U.S., and the greatest danger I face comes from other bicycle riders (I won't call them "bicyclists", but rather young motorists temporarily bicycling for convenience.) UC Davis features an abundance of bicyclists riding without lights, failing to signal turns, and, of course, riding the wrong way. And, wrong way bicycling absolutely infuriates motorists. They might not scream at bicyclists rolling through stop signs, since most motorists do this as well. But, as this column from New Orleans indicates, no cyclist behavior frosts motorists more than a bicyclist riding against traffic. To be sure, much of the wrong way bicycling behavior occurs because of poor street design. For example, one way streets that don't facilitate bike travel to desired destinations. Or multi-lane roads with a long barrier divider, impeding bicycling in the desired direction. Better design of streets, Complete Streets, should be the goal of every community. Many cities have also found "sharrows" to be very effective at reducing the incidence of wrong way bicycling. Wrong way bicycling is extremely dangerous and offensive. So don't. It ain't worth it. What finally prompted my purchase of a folder? Short answer: higher gas prices. As most conscious bicycle commuters understand, recent increases in gas prices have caused many motorists to reexamine their standard commute mode. Many drivers are flocking to bike shops and emerging as bicycle commuters, and many are also fleeing to transit. Which means increasingly crowded transit systems, and growing competition by multimodal bike commuters for space on buses and trains. As many bike commuters who rely on Caltrain in the Bay Area will tell you, overcrowded transit can mean bicyclists waiting for later trains or buses. A folding bike avoids this challenge. Nearly all transit systems in the U.S. allow folded bikes onboard, even during peak rush hour periods. My present commute--between home in Sacramento and office at UC Davis 17 miles away--is made with a combination of bicycling and transit. I usually board with my bike on the Amtrak Capitol Corridor, but I also occasionally use the UC Davis shuttle bus or Yolobus. (Most days I use transit for morning commute, and bicycle the entire distance home.) All these transit services have been much--much!--more crowded, and I have been anxious about getting stranded or delayed by a lack of bike capacity. Hence the Giant Halfway acquisition. 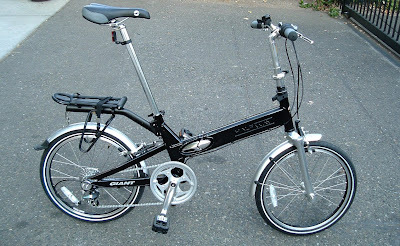 Of all the folding bikes available, what was appealing about this bike? First, the Giant Halfway is relatively affordable, sold at an attractive price point. Depending on your needs, it might work for your budget. Second, it is relatively quick to fold. Many folders, such as some models of the Bike Friday line--are really travel bikes--offering great ride quality but requiring more time to collapse; suitable for a trip to Europe or elsewhere, but maybe not the best option for quick folding as you rush to your bus or train. This Giant Halfway is affordable and quick folding. It is also very smartly designed. The geometry is great; meaning the ride quality doesn't feel cramped, "squirrelly," or uncomfortable. The single front fork (above) facilitates quick folding, and also easy repairs of flats. 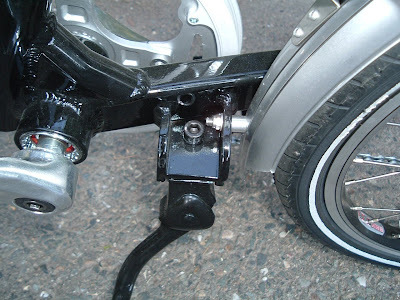 You don't need to remove the entire wheel, just the inntertube. The Giant Halfway also offers great features, such as fenders, kickstand, and a rear rack. 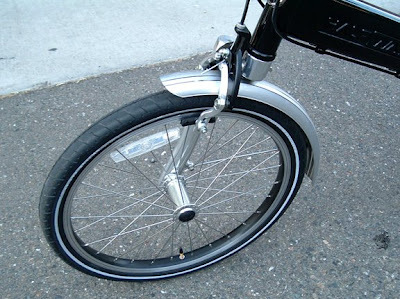 The designers even created a special mount (above) for the fenders and kickstand, showing the Halfway's intended purpose as a practical commuter. It's a smartly designed bicycle. Again, there are many great folding bicycles on the market today, another sign that the bicycle industry is moving to better serve the commuter market. Great folders include the Breezer Zigzag, the Brompton, and the KHS Mocha/Latte. 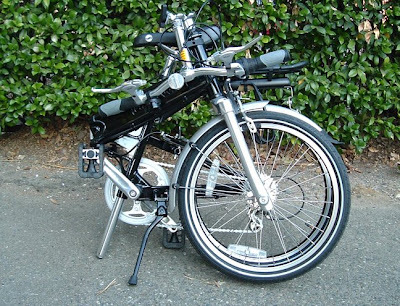 If you are a multimodal bicycle commuter fearful of rapid crowding on transit systems, or live in a small apartment, or lack secure bike parking and need to bring your bike into your office/workplace--you might want to consider a folding bike. Any other suggestions you might share? Your experiences with folding bikes? Most images of cycling presented in mass market ads follow one of two distinct approaches--one positive, albeit often nostalgic, the other unfortunately negative. This dichotomy neatly reflects the conflicted perception of the bicycle in our society. On the positive side, images of riding through sunny wildflower-filled meadows or along quiet tree-lined streets are used to evoke warm feelings about simpler times, healthy living and good clean fun. This approach is used to sell everything from medicines and personal hygiene products to real estate developments and banking services, with the bicycle emblematic of life lived better. On the dark side, negative ads typically depict riding a bike to actually go somewhere as a desperation move to be avoided. Some poor guy is shown ridiculously crouched on a child's bike or glumly struggling up a hill, his punishment for not buying the advertised product (usually car insurance, car parts, or even the car itself) which would have kept him among the happy motorized masses. Excellent article from Alabama by Doug Daughhetee, who initiates a new cycling column in the Birmingham News with this provocative piece. How many of us bicycle commuters have not been offended by some ridiculous television commercial? My personal least favorite commercial at present is a noxious ad from Autozone, which seems to plague every baseball game I watch. (Other than "South Park", my only consistent television habit is baseball.) The commercial shows some teenage boy (of course he's male) spending the hot summer fixing a broken down car at the side of the road, with a sign in the window declaring "If you can fix it, it's yours!" Making frequent trips on his bicycle to the local Autozone for helpful advice and parts, the kid gets the jalopy running: "At least the next time I come to Autozone, it won't be on my bike!" Yeah, right. In my ending of this silly commercial, the kid spends lots of time and money fixing the junker and just before he makes the final critical repair...the county tows it to the scrap yard. Am I cruel? Or realistic? What's your least favorite broadcast or internet commercial these days? The challenge for bike commuters isn't just about finding space on our streets. It's also about finding space in our culture. It's clear from all the recent news coverage of bicycling that we have an opportunity right now, thanks to rising gas prices. The recent growth of bicycling blogs, sites, publications, and advocacy groups is very encouraging. The moment is ripe, and we need to be present. On the streets, and in the culture. These bicycles, made in the 1970s and 80s, used 27-inch wheels, which have been replaced with the smaller 700c wheels by road bike manufacturers. 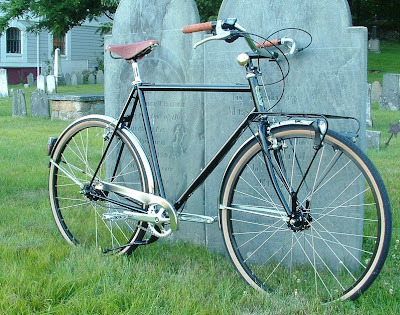 But a recent surge in sales of 27-inch tires suggests that the lowly steeds of yore are gaining new life as commuter bikes and weekend cruisers. This time around, bike owners have more high-tech tires to choose from. The latest models feature increased thread counts in tire casings, and Kevlar and other space-age fibers to improve puncture resistance, as well as sophisticated rubber compounds that are durable, improve traction and enhance ride quality. “The manufacturers can’t make the tires fast enough,” said David Pierce, a senior buyer at Quality Bicycle Products, one of the country’s biggest parts distributors, who reported a 200-percent increase in sales of the tires this year. I've been fortunate to have pedaled many miles on older 27-inch wheeled bicycles, including a much missed Trek Touring Bike. I have no 27-inch wheels in my current bike stable. It seems many fuel pump refugees are dusting off their own older bikes and fixing them up. This article features five brands of tires in 27-inch sizes. Any other suggestions? I used to be almost exclusively loyal to Continental Top Touring (now the "Touring Plus ") tires, which I continue to admire and believe still come in a 27-inch size. In recent years I've been broader in my tire use, and have been very impressed with the Vittoria Randonneurs on my touring bike (in a fat, comfortable 700x38 size.) Now on my second set of these, and they've been great. Dutch bicycles finding market in U.S.? If you like the idea of cycling to work but are loath to join Vancouver's growing army of two-wheeled, pedestrian-dispersing, 24-speed seawall warriors, there is an alternative. "And there's no spandex," noted Rob MacDonald, co-owner of a company that's bringing the European way of urban cycling to North America. "We have fashion police out there and we'll find you." MacDonald and business partner Jane Cox own Jorg & Olif (www.jorgandolif.com), a Vancouver-based e-commerce company that imports Dutch city bicycles known for comfort, style and convenience. So far they've sold about 1,000 bikes across North America--300 in Vancouver--but there's not a current storefront in Vancouver and they must be ordered online. The company, which recently closed its local warehouse, is now negotiating a store presence with a Vancouver bike store, where customers can test-ride and buy the bikes. "The biggest challenge is introducing a new concept to the marketplace," said MacDonald, 36, of Jorg & Olif, his first business venture. "The idea of a bicycle just for the city is relatively new in North America, where [bikes] are mainly for recreation or sport. It's been an interesting learning curve for us to communicate that. And the supply chain has always been a challenge. It's more complicated than we ever imagined." 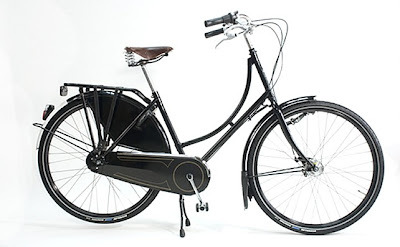 Interesting article from Vancouver, about the growing appeal of classic Dutch bicycles. In the Netherlands, bicycles are an accepted and integral part of the transportation system, meaning bikes are designed to be practical and durable, just like the famous Flying Pigeons of China, the Atlas Roadsters of India, or the ubiquitous "mami charis" of Japan. With the growing interest in bicycle commuting in the U.S., is the American bicycle market ready for a heavy, slow, urban bike (complete with kickstands)? There are many differences between the Netherlands and the U.S. (what an understatement): cultural, social, historical. A major difference is simply community design: Dutch cities tend to be compact and dense, with narrow streets and slow average traffic speed; while most American cities are spread out, low-density, with wider streets and faster traffic. A few American bicycle companies, notably Breezer Bikes, have attempted to emulate European bike design while offering enough performance technology to deal with street conditions in the U.S. For some fortunate bike commuters with short trips, a Dutch bike might great. What do you think? Can you see yourself making your commute on a 40-pound bicycle? 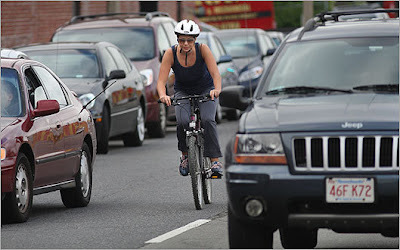 More bicyclists provoking driver backlash? When gas prices surged above $4 per gallon earlier this year, it didn't take Nostradamus to predict that there would be a resultant rush to carbon-free commuting options—especially in a place like Portland, which is known for its ample network of bike lanes. Cyclists in "Stumptown" are spinning their spokes here in unprecedented numbers, trading in their fuel-guzzling SUVs for stylish 27-speeds. But the cycling surge has created conflict, as the new breed of commuters bumps up against the old, oil-powered kind...An escalating war between two-wheelers and four-wheelers, brought on by sky-high gas prices? Absolutely not, insist cyclists, city officials and the local newspaper, which has called the hoopla "a war of anecdotes." Injuries to cyclists remain steady even as ridership surpasses record levels, according to statistics kept by the city. Portland was recently named one of two "platinum" U.S. cities by the League of American Bicyclists, and most agree that there's safety in numbers; more pedestrians and cyclists on the road means more awareness and greater caution on the part of drivers. Provocative article about a purported escalation of conflict between bicyclists and motorists on streets in Portland and other American cities. Record high gas prices are clearly leading to more bicyclists. Combining this trend with widely publicized incidents at Critical Mass events in New York City and Seattle, a few journalists have aroused themselves to suggest a raging battle on the nation's streets. Hmmmm. Count me among the skeptical. Typical of this coverage of animosity between drivers and pedalers was a recent Reuters article, Cyclists and drivers struggle for harmony, which also pointed to the incidents in Portland. Another recent article in the Wall Street Journal, Risking Life and Limb, Riding a Bike to Work in LA, highlighted the hostility from motorists confronting some Los Angeles area bicyclists. "Cyclists have equal rights, but in fact a lot of motorists think they should get off the road," Lynne Goldsmith, manager of the Los Angeles Metropolitan Transit Authority's bike program, told the Journal. "When we're used to seeing more cyclists, we will treat them better." For more than 60 years transportation planners prioritized vehicle speed above nearly every other consideration, providing motorists with a great sense of empowerment. It will be some time until we can quantitatively determine the significance of the reported surge in bicycling, and if it will persist. If bicycling activity does continue to grow, this should support advocacy demands for improved street design ("Complete Streets") to better accommodate bicyclists. As always, bicyclists will need to be involved with advocacy. I'm admittedly fortunate to travel in a relatively bicycle-friendly environment, commuting from my home in bronze-level bicycle city Sacramento to my office in platinum-level Davis. My own experience and my understanding of the research confirms Lynn Goldsmith's assertion, that more bicyclists equals greater safety for all bicyclists. But what's your experience where you travel? Are drivers really getting more hostile? I thought this was an interesting finding using Google Trends, a tool from Google that allows users to analyze the trends for search volume for any term. What the graphs above show is that Google search requests for the terms "bicycle commuting" have surged this year beginning in the second quarter, up between 15 and 20 times compared to the baseline average search traffic for the terms (represented as 1.0) since 2004. 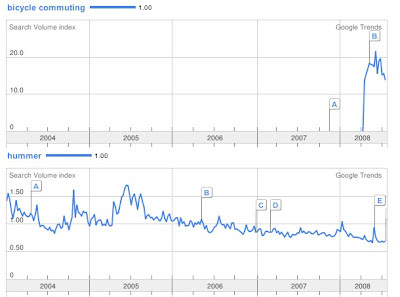 At the same time, searches for "hummer" peaked in 2005 and have decreased steadily ever since. In short, this provides another clue that high gas prices are causing people to take a closer look at bicycling for transportation. Note this is a relative comparison: searches for "bicycle commuting" this year compared to such search volume for those terms in past years. An absolute comparison shows that more people still search for "hummer" than "bicycle commuting", but at a slower level when compared to previous years. And maybe they're looking for ways to sell or dispose of their Hummer.